I decided to make this cake yesterday since I didn’t go to see Usher because my best friend hates me. But that’s not important. What is, is this truly decadent cake that has no other explanation apart from being an homage to all things good in this world : chocolate, cream and red fruit. I’m a huge lover of red fruits especially berries (this has been a psa if we’re ever playing a game together and you need to know what my favorite fruit is so we could win a million dollars or something). 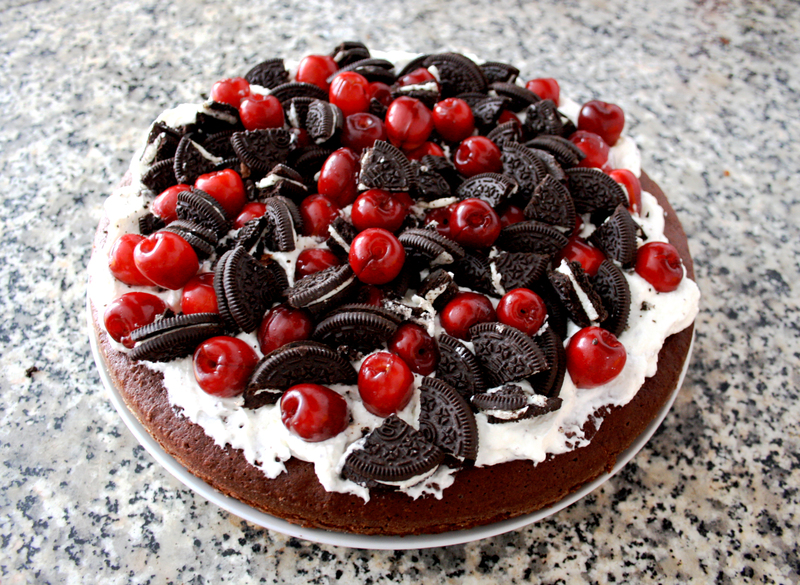 Red fruits and chocolate go together particularly well, and this cake is the ultimate treat for all black forest cake lovers. It’s crazy easy to make, you can bake it for a party, do it for your loved one, or even bake it for yourself cause you are the first person you ever need to impress and give nice things to. You deserve it. Put your rack in the oven and preheat to 175 degrees C. Grease your cake pan, butter it up and dust it with flour and look at how nice it is. Melt your chocolate in a bain marie, when all done, add your butter and make sure to combine well. Add the baking powder and the flour and put aside. Put your eggs in a bowl and whisk them with the salt, vanilla sugar and powdered sugar. You whisk those babies till your arm mostly falls out and it doubles in volume. Now you’re good. Add the buttery floury chocolatey substance to your bowl and whisk some more. Pour this lovely mixture into your pan and cook for about 30 to 35 min. Check with a knife mid bake to see if it started to harden. You want your cake to be a little gooey. When your cake is done, put it aside to cool. (If you put your cream on it right away it will obviously melt). Whip your cream and very finely crumble some oreos to add to it. 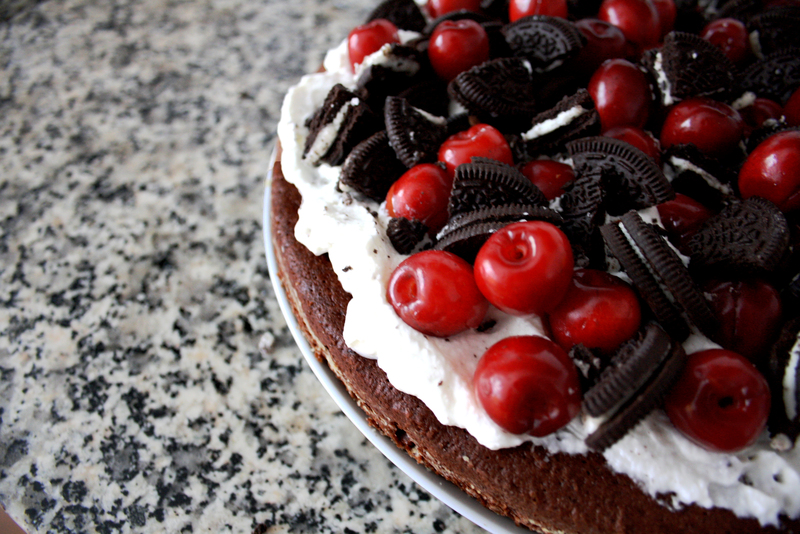 When your cake is cool enough, spread the whipped cream around, top with cherries and the rest of the crumbled oreos (those don’t need to be as crumbled, just cut a cookie in like 4 or something). You are now DONE ! Such a great baker I am amazed wow. If you liked this recipe, let me know in the comments, and if you decided to do it, show me what you’ve done !